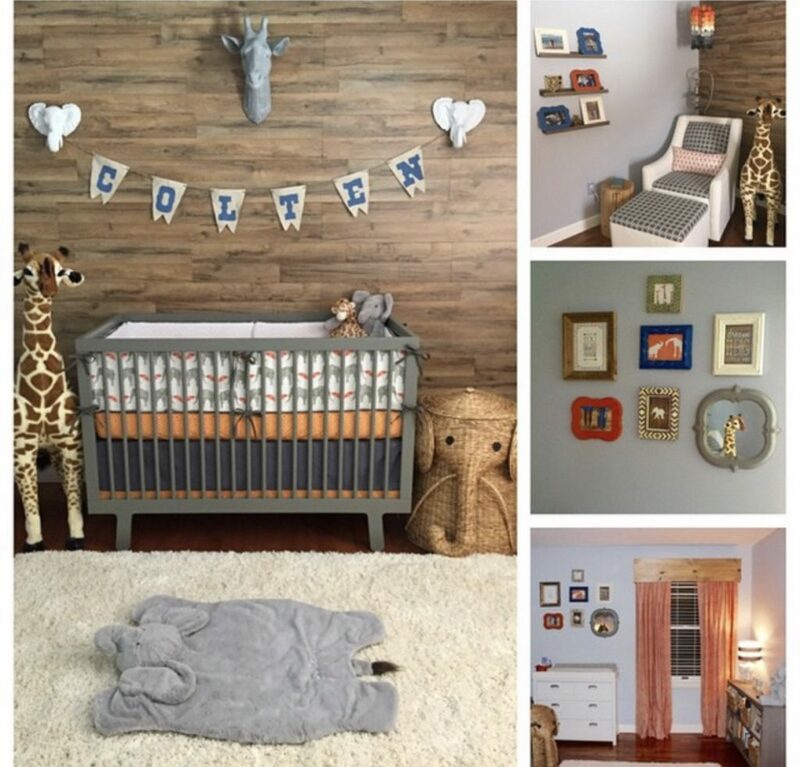 Colten’s Nursery was so much fun to design! We wanted to go for a rustic yet modern safari themed nursery. We were determined to build a wood wall as a backdrop. After looking into several options, my husband and I actually found this wood pattern at Lowe’s. It’s flooring! Our friend Curtis and him installed the wall over a weekend to set the design stage for the room. Thank goodness for all their hard work! I did a lot of pointing and directing given I was 7 months pregnant at the time. In addition to the wood wall, we made the wood valance ourselves over the window space. $20 in product at Lowes, piece of cake to make. We incorporated colors such as grey, blue, orange, and white throughout the nursery. I worked with NEWMOMDESIGNS on Etsy to create custom bedding to go with the theme and feel we wanted for the nursery. Elvina does amazing work, I would highly recommend her to anyone. Our safari theme included giraffe’s and elephant’s throughout. I created a collage wall filled with cute baby sayings and pictures all in our theme of animals as well. In addition, we wanted to bring our theme together with faux giraffe and elephant heads to make a statement on our wood wall. Both the collage signs and faux animal heads I found on ETSY. My ever so talented girlfriend Kelly made the darling Colten banner to tie the room together. Creating this nursery for Colten was so special and he loves spending time in his room with all his safari friends!